Charles Koch is an American philanthropist and businessman who is the co-owner and CEO of Koch Industries. His younger brother David inherited the business from their father, Fred Koch, who had founded the company in 1940. Koch is one of the richest businessmen in the world, and both of him and his brother David Koch, each own 42% of the conglomerate. As of 2019, Charles Koch’s net worth is estimated to be roughly $50.4 billion dollars. Charles Koch was born on the 1st of November, in Wichita, Kansas. Koch is the on to Mary and Fred Chase Koch. His father Fred, was an engineer who later turned to be an industrialist who later founded what was to become Koch Industries. Koch has three brothers: Frederick, David, and William. Koch attended the Massachusetts Institute of Technology (MIT) to study engineering. He earned his Bachelor of Science in general engineering in 1957, and a Master of Science (M.S. in mechanical engineering in 1958. After Koch’s graduation, he joined Arthur D. Little, Inc. This career lasted for a very short while as he moved back to Wichita in 1961 in order to join his father’s business, Rock Island Oil & Refining Company. Koch was a hard-working man, determined to expand the family business which had become a medium sized oil firm by the late 1960s. Koch worked tirelessly to grow the business which is today involved in diverse fields such as energy, fiber, chemicals, polymers, pulp, paper and minerals, and more. A highly competitive businessman, he worked tirelessly to grow the business which is today involved in diverse fields such as the manufacturing, refining, and distribution of petroleum, chemicals, energy, fiber, intermediates and polymers, minerals, fertilizers, pulp, and paper. He became the Director of Koch Industries in 1982 and also serves, or has served, as the Director of other corporations such as Entrust Financial Corp. and Georgia-Pacific LLC. Today, Koch Industries, have invested more than $70 billion in acquisitions and other capital expenditures and own Invista, Georgia-Pacific, Molex, Flint Hills Resources, Koch Pipeline, Koch Fertilizer, Koch Minerals, and Matador Cattle Company. Charles Koch credits his phenomenal success to the business philosophy of Market Based Management (MBM), a concept which he developed. Koch supports a number of free market-oriented educational organizations, such as Cato Institute, the Institute for Humane Studies, Bill of Rights Institute, and the Mercatus Center at George Mason University. As of 2019, Charles Koch’s net worth is roughly $50.4 billion dollars. By choice, Koch Industries opted to stay out of the limelight for much of its existence. It did this mainly because it was ingrained in the brothers from a young age, by their father, that humility was a virtue; and that seeking attention, or bringing it upon oneself, would lead to distractions away from a business, unnecessary scrutiny and personal attacks. The Kochs are now known as controversial, billionaire political activists. But it wasn’t always this way. Charles Koch, a brilliant businessman, made a critical mistake of throwing his company in the middle of his personal political agenda. Koch Industries originally started as a crude oil refining company (in the 1940s). After establishing its brand as a trusted business within that industry, the company grew into a globally diversified corporation. Now working in cattle, fertilizer, pulp and paper, minerals and many other industries, Koch used its early success in the oil business to springboard into other lucrative sectors. Charles Koch has been the co-owner, chairman, and chief executive officer of Koch Industries since 1967, while his brother David Koch serves as executive vice president. Both of the brothers are considered to be two of the richest persons in the world. 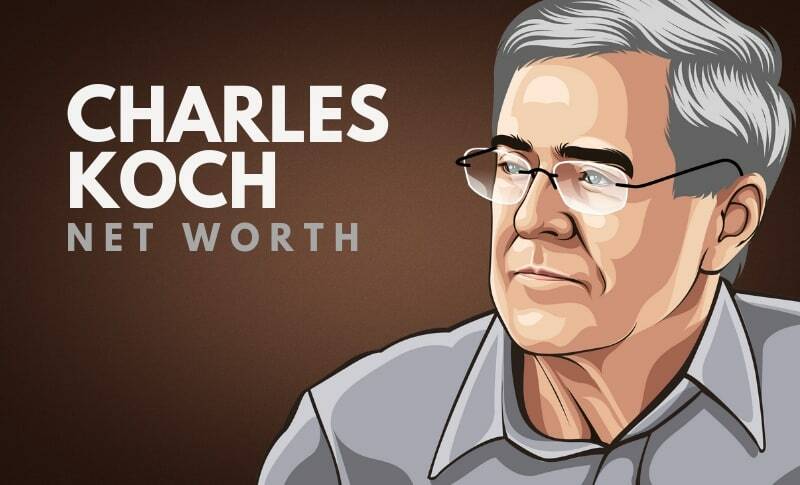 What do you think about Charles Koch’s net worth? Leave a comment below.